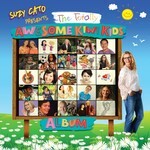 Children's TV legend Suzy Cato presents 'The Totally Awesome Kiwi Kids Album'. This unique project brings together 25 incredibly talented Kiwi artists who specialize in children's music. The album is jam packed with catchy choruses, rich melodies and a great deal of humour to create the perfect Christmas gift for kiwi kids.